The Daily Digress: I love my life and I love me some quinoa. I love my life and I love me some quinoa. Remember how you boiled a bunch of quinoa at the beginning of the week and kept it in a closed container in the fridge so you could use it as needed without having to boil it every time? Well, first of all, I think it would be nice if we could boil the hugest pot of it ever, divide it into freezer bags and take it out of the freezer as needed. Is this a good or bad idea? Discuss. For the last two days, I've enjoyed Breakfast Quinoa, which is certainly not an original idea on my part, but I will tell you how to make it easy. Put a pot on the stove. Put a scoop of cooked quinoa in the pot. Add a splash of your milk of choice. I used Rice Dream Supreme Vanilla Hazelnut, which is now being sold at a closeout price at one of my local Fancy Marts. Which scares me. Cook those together for a bit, maybe until the milk almost boils, but doesn't. Put it in a bowl and add your favorite dried fruit and a sprinkle of your favorite nuts*. 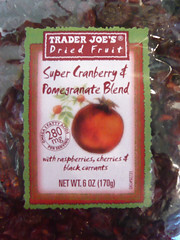 I'm a fan of toasted almonds and this cranberry pomegranate mixture from Trader Joe's. Dried, tart cherries and pecans would be lovely, too. This is so delicious, I can't even tell you. Like steel-cut oatmeal, but better. And, as you may have heard me mention, quinoa is the bomb because it contains all nine essential amino acids needed to qualify as a complete protein. The whole theory of complete protein is up for debate, but is that really my problem? Or yours? Nope. So, eat up. 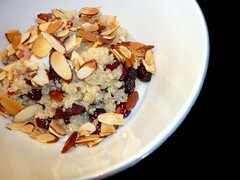 Quinoa is also very easy to digest, the perfect morning treat. And here is yet another quinoa recipe (just try and stop me.) I served this on Friday night with steak, collards and rice. My sister finished what was left in the salad bowl in the kitchen after dinner, which made me feel a little sad because I had plans for that salad. Plans to eat it for lunch. But oh well, because I still have cooked quinoa, so I can make it again. Whenever I want. In a pan with olive oil, sautée a scoop of cooked quinoa, a handful of frozen corn and a handful of pine nuts. Almonds would be nice, too. Or pecans. Any nuts, really**. Let them get a little bit brown. While they cool, dump a whole bag or clamshell box or mess of salad greens in a pretty salad bowl. Add the quinoa, corn and nuts and much less vinaigrette than you think you need. Your favorite oil and vinegar-type dressing will be just ducky. I am currently having a hot and steamy affair with the vinaigrette from local restaurant Moe's Italin Grapevine. Rumor has it the Social Pig might start carrying it. That would be great. Toss everything together and serve. Yum. And what about the rest of this post's title? "I love my life," in case you weren't paying attention. Why, you might ask, would I need more than the joy of quinoa? Well, I don't, but I'll take it. Simon and Schuster sent me an advance copy of a novel coming out this summer for review. It is the sort of novel I happen to love, about glamorous ladies with interesting and cute problems that (I hope) are eventually solved. I think "Chick Lit" sounds a bit dismissive, but I love it so who cares what we call it? Anyhow, I have read so many of these novels, I often can't find a new one in the library or book shop. Or I buy one and half-way through, realize I've already read it. I can't wait to dig into this one. And, although this may seem like nothing to some of you, I'm tickled pink that someone wants my opinion. I'm tickled pink that I've turned sharing my opinion about stuff I like into a job. I really, really am. And, gosh darnit, I feel fancy. * That's what she said. No, really, she did. I heard it. ** Why are you even looking at this? You know what's coming...that's what she said. You made me miss Trader Joe's (as well as making me hungry!) I wish we'd get one here in Columbia.